Dr. Smith's ECG Blog: What is lurking underneath this new right bundle branch block? What is lurking underneath this new right bundle branch block? A 72 year old female with hypertension and COPD presented with sudden shortness of breath and chest pain. 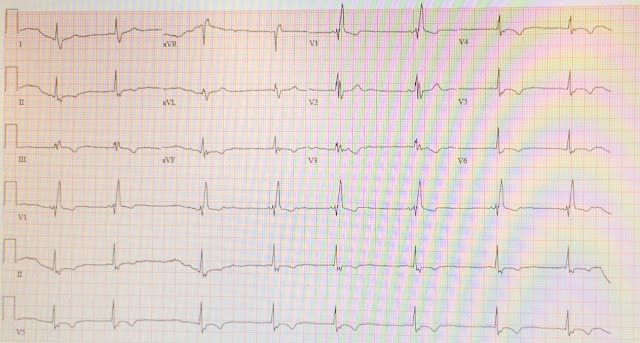 There is sinus rhythm with PACs and PVCs. More important, there is right bundle branch block with hyperacute concordant T-waves in V3-V6, as well as hyperacute T-waves in leads III and aVF with reciprocal ST depression in aVL. This distribution is classic for a type III "wraparound" LAD occlusion. As a general rule, right bundle branch block should usually not have any ST elevation anywhere on the ECG, and the leads with large R' waves such as leads V1 and V2 should have either baseline J-points or some slight ST depression, with negative T-waves. The rhythm is interesting but not particularly relevant. After the PVC, there is return of sinus rhythm for one beat, then a PAC, then three sinus beats, then a pause followed by a low atrial escape beat, etc. See Ken Grauer's excellent discussion on the rhythm in the comments below. Initial troponin was negative. She was not taken immediately for cardiac cath, as these findings were not appreciated in the setting of RBBB. She was admitted to the cardiology unit. The second troponin I returned elevated at 6.4, and for some reason there were no more troponins measured after that. Resolution of findings above, as well as new deep T-wave inversions in V3-V6 and inferior leads, consistent with reperfusion. On day 3 of hospitalization she underwent coronary angiography, revealing a 95% lesion in the mid-LAD which was stented. One can say with full confidence that is was completely occluded at the time of the presentation ECG. Peak troponin, echocardiographic findings, and long term outcome are unknown. 1. RBBB should usually not have any ST elevation, and will usually have some ST depression and T-wave inversion in the right precordial leads. 2. The combination of findings consistent with acute coronary occlusion in the anterior and inferior leads is likely due to a large "wraparound" LAD occlusion, should not be confused with the "diffuse" ST elevation of pericarditis, and will usually show reciprocal ST depression in aVL. 3. The rules of appropriate concordance apply to all forms of abnormal ventricular conduction. In the case of RBBB, which has an up-down-up complex in right precordial leads V1-V3, it is the last part of the QRS which determines the expected discordant ST segment (the last part is a positive R'-wave, and therefore discordance will manifest as ST depression in V1-V3. 4. T-waves are just as important or more so than the ST segments when looking for acute coronary occlusion. 5. A new right bundle branch block in a sick patient with chest pain and/or shortness of breath is a worrisome finding concerning for LAD occlusion or significant pulmonary embolism. Nice case. As per Dr. Smith — the initial ECG is diagnostic of acute occlusion of the LAD with “wraparound” suggested by simultaneous acute inferior lead changes (together with reciprocal changes in lead aVL). I suspect that the initial rhythm is actually not sinus. It would have been helpful to have a simultaneously recorded long lead II for this 1st ECG … The PR interval for conducted beats is not constant during the long lead V1 rhythm strip. That is, the PR is shorter (probably too short to be conducting from the SA node) for at least the 4th, 5th, 6th, 7th; 9th and last beat in the tracing — compared to the beats that end the relative pauses in the rhythm. Those beats that do show a fairly constant R-R interval (and manifest consistent P wave morphology), are beats #4,5,6,7. These beats are not early, so they probably represent the underlying rhythm — and the PR interval in the long lead V1 for these beats is too short to be conducting from the SA node. Of note, the only clearly conducting beat of the 3 beats that we do see in lead II is not clearly preceded by an upright P wave in lead II. So, of academic interest (admittedly not relevant to the acute coronary occlusion that was overlooked) — is the finding that the initial rhythm was probably from an ectopic atrial site + PACs and occasional PVCs. Given that patient is a known case of COPD, how about calling the rhythm a wandering atrial pacemaker with PVC? Thanks very much, as always, Ken! Thank you.. I remembered your blog which talks about this... Thanks again..
nice case , and discussions, drs Meyers and Grauer. ps: it seems pretty clear that ecg 1 was "unhealthy". even ST elevation in aVR. , besides V1-3. and very "fat" concave upward T's inf/lat. i wonder if other initial ECG's were performed, altho i think there was enough for cath on just this first. Because the findings discussed above were not noticed, apparently. There were no obvious other reasons such as a goals of care contraindication.